The Jazz his a franchise record three pointers at the expense of the Spurs. The Utah Jazz offense has not been very good this season. Coming into the game, they were 26th in the NBA in both points per game at 105.7 and three point shooting at 32.6%. None of that mattered tonight, as the San Antonio Spurs allowed the Jazz to drop 139 points and shoot a ridiculous 20-33 from beyond the arc. Tuesday’s poor defensive effort was just another in a long line of poor defensive efforts this season, continuing the narrative that the Spurs have not assembled a team that can compete at the highest levels — or perhaps even the middle levels — of the NBA. With this loss, the Spurs once again find themselves fourteenth in the Western Conference. 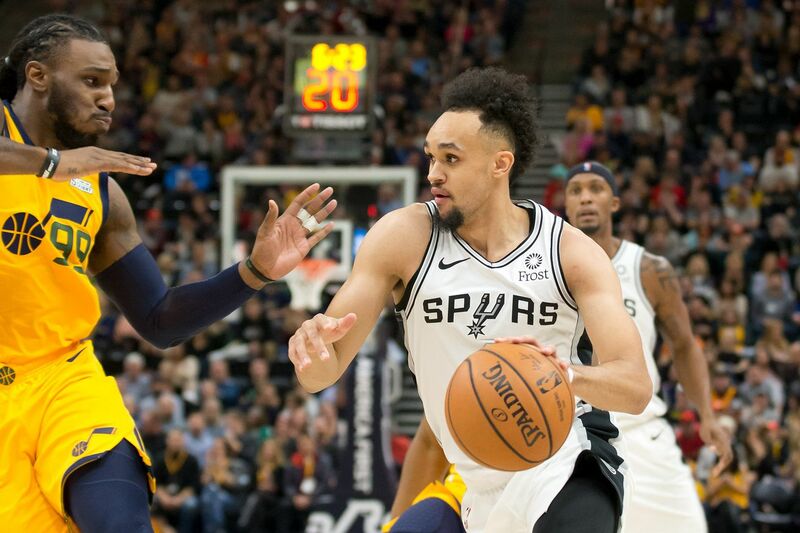 The jury is still out on Derrick White, but the guard rotation of DeMar DeRozan, Bryn Forbes, Patty Mills, and Marco Belinelli is nothing short of a disaster on defense. None of these players can stay in front of the person they are guarding. This allows opposing guards to get to the paint at will, breaking down other areas of the defense, resulting in layups, lobs, or wide open three point attempts. Sure, having Dejounte Murray would have helped defensively, but who’s to say teams wouldn’t have implemented the same tactic with Murray that they used to do with Kawhi Leonard; leave him on an island in the corner and play four-on-four basketball with everybody else on the court? After the game Coach Pop referred to the Spurs as “defensively challenged.” He’s been saying that a lot this season, so it’ll be interesting to see if anything is done to overcome this challenge. I’m honestly not sure if it has to do with a lack of aggression or a lack of skill. I’d like to believe the issues are solvable, but all the evidence seems to suggest otherwise. The definition on insanity is doing the same thing over and over expecting different results. The Spurs porous defense wasted no time giving up thirteen points in the first three minutes of the game, including three three-pointers and a transition lob off a missed shot. Unsurprisingly, this prompted an early timeout from coach Pop. The poor start against the Jazz continued the Spurs’ trend of falling behind early in games. Davis Bertans got the start over Dante Cunningham for the second straight game, but Bertans has yet to solve the Spurs’ starting woes. The lineup of Bryn Forbes, DeMar DeRozan, Bertans, Rudy Gay, and LaMarcus Aldridge have a negative 57.8 net rating – offensive rating minus defensive rating – in the 25 minutes they have shared the court together over the past two games. Pop needs to find a winning combination in the starting lineup sooner rather than later, as neither their offense or defense is built to comeback from large deficits. Though the Spurs’ found a nice rhythm on offense in the second quarter, they were still unable to string together enough stops on the defensive end to make it a competitive game. The Spurs found themselves down by 16 after the first half due in large part to the free throw discrepancy (13-16 for Jazz vs. 2-2 for Spurs) and three point shooting (10-17 for Jazz vs. 3-9 for Spurs). There’s not a whole lot to report on in regards to the second half of the game. The Jazz extended their lead to over twenty points early in the third quarter, prompting Coach Pop to go with his reserves the rest of the way. The Spurs are on the front end of another back-to-back, so resting his starters in a certain loss seems like the right call. It’s starting to feel a bit too much like groundhog day with all of these blowout losses. Losing one such game is bad enough, but three over the course of a week is inexcusable, especially with two All-Stars from last season on the team. The Spurs have no time to lick their wounds, as they fly to Los Angeles to play the Lakers tomorrow. With nobody playing more than 24 minutes in this one, I expect all the non-injured players to be available for tomorrow’s game. Does Ricky Rubio have some type of personal vendetta against San Antonio? I mean seriously, does he ever miss against the Spurs? He’s a career 32% shooter from deep, but shot a tidy 2-3 this game. Jakob Poeltl really does appear to be coming into his own this season. He seems more comfortable with his teammates and continues to make fundamentally sound hustle plays throughout the game. He finished tonight with a season-high 20 points on 9-11 shooting. Unfortunately, the whole game kind of felt like garbage, so it’s hard to know how many of those points came in garbage time and how many came when the game mattered. Belinelli continues to look rough out there this season. I know Pop would never do this, but once Lonnie Walker IV is fully ready from a health perspective, I’d love to see him eat into Belinelli’s minutes. We know what we have in Belinelli. Now’s the time to see what some of the younger pieces have to offer. For the first time since the 2014-2015 season, Rudy Gay had zero points in a game where he wasn’t injured or resting. He scored those zero points on three attempts in 18 minutes. Joe Ingles is a gritty defender, but Gay was far too passive tonight. I don’t understand how the Spurs can look so tough and aggressive one night but soft and passive the next. LaMarcus Aldridge had his second straight efficient night from the field, going 7-10 and scoring 16 points in only 22 minutes. He’s now shot 18-25 the past two games. It would be a great Christmas present to us all to have him return back to the Aldridge from last season. Only then can we start to see what the ceiling is for the Spurs this season.